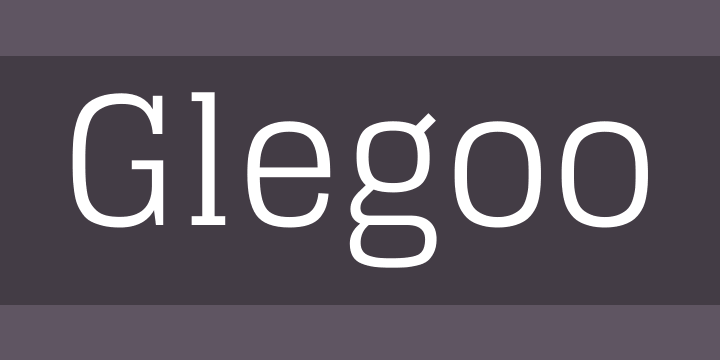 Glegoo, a truly modern slab serif. It has a precise balance of shapes, counterforms, and strokes. Glegoo is slightly condensed, has a large x-height, short ascenders/descenders, and large counterforms. These attributes all add up to help reading a text, even in very small sizes. Its careful design and proper choice of weight generate a nice texture in paragraphs of text, but the design is also intended to work well when composing headlines with presence and elegance. Large usage will show off the delicate modulation of strokes that are in this font.